Are you struggling with the manual handling of goods? Whenever you need help lifting or handling goods, TAWI has a solution for you. With our lifters, anyone can lift safe and easy. Our vacuum lifters handle goods up to 270 kg, and our skilled engineers have long experience of developing customized solutions to meet your needs. Here's an example where a customer needed to lift 20 kg boxes that cannot be gripped from the top. Solution - lift from the side. 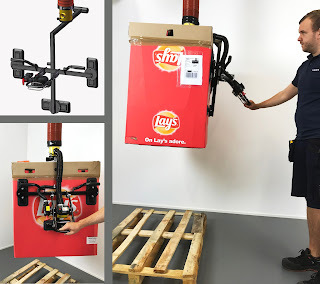 The lifter is easy to handle and anyone in the staff can now easily lift this big box onto a pallet. When lifting is easy, work is efficient and safe. Contact us today, and we'll present you with a lifting solution for your needs.